I have a bad habit of keeping everything. A few years ago, my mother picked up a couple of dollar shirts for Lance at a garage sale. One didn’t fit quite right, so I threw it in the pile of items to sell. Some time later (before I’d sold anything from the sell pile) I needed a few buttons fast, so I haphazardly took them off that shirt—and tore it in the process. Whoops. That makes it a little harder to sell. So, to avoid unnecessary waste, I put the shirt in a pile of scrap fabric… that somehow made its way to the hamper, where it sat at the bottom unwashed for, I don’t know, like two years. Ha. Ha ha ha. Hahahaha. That’s sad to admit aloud. But last week I actually removed and washed every item from the hamper, which is how I re-found the shirt. I decided it was time to act, so I snipped off the collar and promptly put it on my cat. He looks hilarious wearing a collar. So. Funny. Once he was done rocking business attire, I put it on me. Less funny, but still good. Stand-alone collars are far from new, but I rarely loved the way they looked. Wearing a boatneck blouse makes the collar pop against the bits of bare skin. I’m so glad I never threw the shirt out. Messy apartment for the win! I’ll happily remember this next time I get rid of anything. 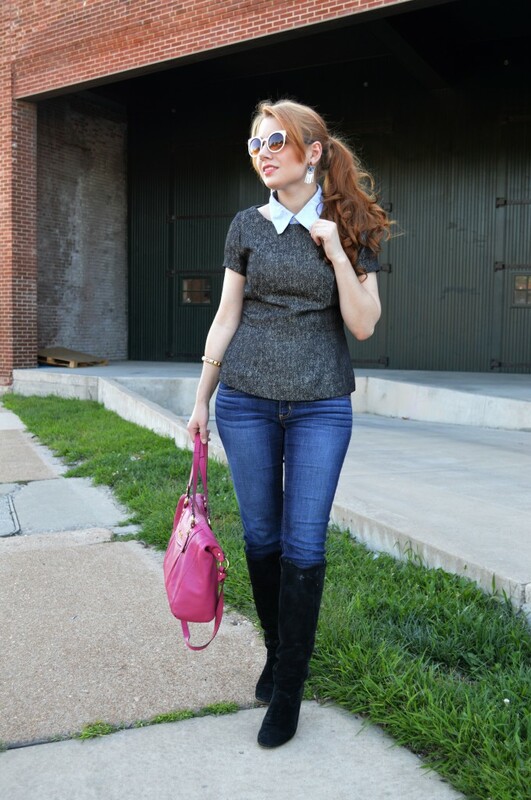 Don’t forget to vote in the Saint Louis Fashion Blog Awards TODAY! Oh, Julia Ann is nominated in five categories. Click HERE, then click VOTE NOW. Voting closes today! Thank you for your support! I love collars. Don’t judge (but also the beaded ones). And I love collars and bow ties on pets. Hahaha. Luckily my dog happily obliges.